Our offices have been performing root canals (Endodontics), removal of the nerve from tooth, through Root Canal Treatment for over 40 years. Our goal is always to make a Root Canal Treatment as quick and painless as possible. 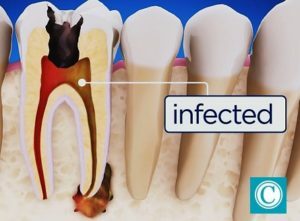 Performing treatment on an infected tooth allows us to decontaminate the pulp caused by bacterial presence inside of the tooth structure, relieving pain and allowing the tooth to be resealed and restored to working function. A Dental Crown is often used to cover & protect the tooth after the infection has been removed. At Carson & Carson DDS, we offer Sleep Sedation which is commonly used in conjunction with a root canal treatment to provide you with a completely painless experience that won’t even be remembered. We are often able to do this procedure the same day. If you are looking for immediate relief from toothache pain, give us a call today (805) 983-0717. A common misconception is that a root canal treatment is a terribly painful process, but this is untrue in a majority of the cases we see. Root canals are used to relieve pain, not cause it. Although most of our patients feel little to no pain when getting a root canal treatment due to the local numbing and pain medications used in this treatment, this process of removing infected pulp is different for every tooth and every patient has a varying level of tolerance for pain. At Carson & Carson, we offer IV sedation for any patient who may fear the pain that may accompany a root canal treatment. Ultimately, a root canal treatment is the solution to a painful problem and is done in order to prevent further pain caused by the infected pulp of a tooth and save the remaining portion of the natural tooth from decay. After the treatment has been performed, many patients experience a small amount of pain and sensitivity for a few days in the affected tooth. Pain medication can be prescribed for those who feel that the pain is too much to handle after a root canal treatment is performed. Recurring or consistent pain that does not disappear a few days after the treatment is not normal and may be a sign of further infection. Call your dentist right away if you are in pain days after your root canal treatment. Local anesthesia is administered by your dentist to numb local area around affected tooth. A dental dam may be placed around the tooth to keep it dry during the procedure. Your dentist will then use a drill to create a hole in the top of the tooth so the inside of the tooth is accessible. Your dentist can now clear the infected pulp out of the tooth and begin the process of tooth repair by shaping the inner chamber of the tooth and root. The chamber of the tooth may have all the pulp washed out of it or have an antimicrobial solution inserted into it to prevent further infection. The dentist can now proceed to fill in the empty chamber with a rubber-like material called gutta percha, and afterward, the tooth can be closed using a temporary filling. After you have healed from the removal of the root, a permanent crown can be placed over the tooth to finish off the procedure. If a tooth is badly decayed or severely broken, a Dental Implant is a more predictable treatment than root canal therapy. This is often the best alternative if the tooth is too fragile for a crown after the infection has been removed. In preparation for the installation an implant, we would first remove the tooth. After the removal of the broken tooth, we would firmly embed a dental implant into the open slot to restore your jawline to beautiful, working order. These here are radiographs, X-RAYS of successful root canal treatments. Some are single canal and some are multiple. Front teeth are single canal, where as the back molars are three canals. 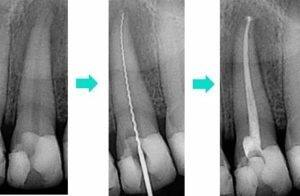 See more of the root canal case studies from our past 45 years of endodontic work. A Root Canal Treatment doesn’t have to be a dreadful, painful experience. Get help from the Oxnard dentists with over 45 years of experience at Carson & Carson, DDS. For questions, or to make an appointment, call our Oxnard office today at (805) 983-0717. We are available 24 hours a day for emergency dental treatment. Affordable dental care and thousands of root canals performed at Carson & Carson, DDS in Oxnard, California. Call Today!